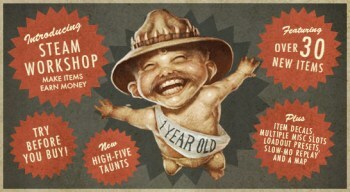 It's the One Year Manniversary of the Team Fortress 2 Mann Company Store! One year ago today [actually, yesterday] Valve opened the Mann Company Store for Team Fortress 2, which lets players purchase not just Valve-created in-game items but also some designed by members of the community, who were paid for their efforts - pretty well, as it turns out. In just one year, community content creators earned more than $2 million for their efforts. Two million dollars! To make life even easier for those intrepid builders and the less-talented members of the community who live only to judge the works of others, Valve has opened the Steam Workshop, an improved version of the content creation hub that will simplify the uploading and feedback process for user-generated content. For those of you who'd rather play than build, a big Manniversary Update brings 30 new hats and other cosmetic items to the game, along with item decals, loadout presets, a week-long "try before you buy" system and even a new taunt. And nearly all of it is on sale! Confound men of science! Become a hot dog expert! Learn how to hit people in the face with a broken bottle! Sound hot? Of course it does! So read all about it at the commemorative One Year Anniversary Mann Co. Update and Sale Catalog.